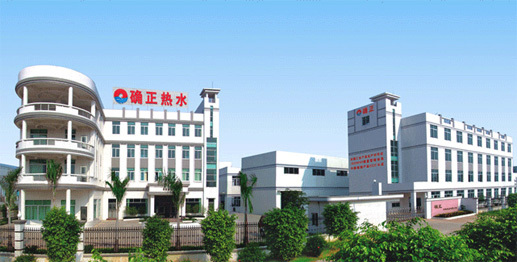 Foshan QueZheng Hot&Cold Equipment Co.,Ltd. QueZheng Cooling and Heating Equipment Co.,Ltd. of Foshan is a standard production workshop has 14000m2 of private technology enterprises, is the earliest development, development, production of heat pump water heating equipment of professional firms, supporting a first-class production equipment, advanced technology, detection measures to improve laboratory. Companies strictly enforce the "ISO9001" quality management system, to develop and produce the first-class energy efficient heat pump water heating equipment, and the development and utilization of renewable energy and protect the environment as a corporate development purposes. Today, the company has indeed a positive development for the domestic production of the largest, most stable product quality heat pump hot water equipment manufacturer professional. The company has successfully developed air source, water series kinds of product specifications, energy-saving equipment than other water up to 30% to 80%, and the products are safe and reliable, completely environmentally friendly features, to meet the different thermal conditions and different customers use water supply requirements. Is a new high-tech thermal equipment. Companies in technology development of products with South China University established a good industry, academia, research relationship, the products have passed the quality of national science and technology achievement appraisal of Quality and Technical Supervision and inspection by the State Ministry of Science and Technology as a national Key achievements to promote the project, while the Ministry of Science designated Division I national "efficient heat pump hot water equipment," the technical support unit, was listed as "national key new products," a number of free support funds. The company is headquartered existing staff as well as a large number of product development projects supporting the design, emphasis on "people-oriented, teamwork, innovation, pursuit of excellence," the entrepreneurial spirit, adhere to the "credibility of the first, the customer first," the belief that the market will continue to develop excellent all heat pump products to improve customer service and loyalty and dedication to the community.